The Overview tab is opened by default when viewing application data for local applications and remote applications. The Overview tab displays the following general information about the application and the runtime environment. PID. This is the process ID of the application. The process ID is also displayed next to the application node in the Applications window. Host. This is the location of the system that the application is running on. Main class. The class containing the main method. Arguments. Displays any options passed to the application on startup. JVM. This is the JDK version of the JVM software. Java Home. This is the location of the JDK software. JVM flags. This displays any flags used by the JVM software when starting the JDK software. Heap dump on OOME. This displays the status of the Heap Dump on OOME option. When enabled, a heap dump is taken when the application encounters an OutOfMemory exception. You can enabled or disable the option in the application popup menu. 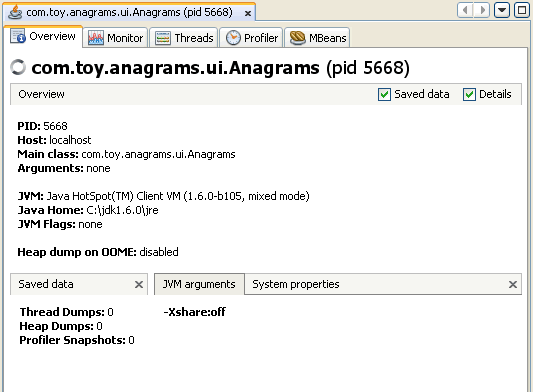 This sub-tab displays application information that Java VisualVM has stored about the application. This sub-tab displays information about arguments passed to the JVM software on application startup. This sub-tab displays information about the system that the JVM software is running on.